New Telescoping Lower Steering Shaft for 66-77 Early Ford Bronco. We will custom make this shaft to fit your application. If you have steering setup that does not match the above options, please put in the notes section prior to checkout as to exactly what you have, or give us a call. 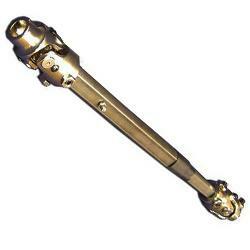 This will help ensure you get the correct steering shaft. Custom made shaft to fit 1966 to 1977 Ford Broncos.